Tag Archive | "Tubifex Worms (Tubifex tubifex)"
Tubifex Worms (Tubifex tubifex) also known to tropical fish keeping enthusiasts as Sludge Worms or Sewage Worms are a segmented worm species found in the the bottom sediments of rivers, lakes, sewer lines and discharge outlets worldwide. Tubifex tubifex is a true earthworm in the class Oligochaeta which is easily recognized by its red color and mud tubes. Tubifex tubifex is actually a freshwater annelid in the family Tubificidae, and is one of the few invertebrates armed with an efficient manner of assimilating dissolved oxygen which allows it to thrive in sewage settling ponds and other bodies of inferior water quality. Ranging in size from .40 to almost 3.35 inches in length, Tubifex Worms are most frequently observed with their head segments embedded in mud tubes and their posteriors waving around collecting the limited dissolved oxygen from the currents created by their tail movements. Tubifex worms selectively digest bacteria that is found in the organic matter of bottom sediment that they inhabitat and can survive in heavily polluted waters by waving their hemoglobin rich tails above the sediment to absorb any available oxygen. 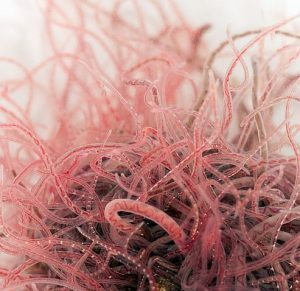 The red color of Tubifex tubifex (also known also as the bloodworm ) is caused by the relatively large supply of hemoglobin which stores available dissolved oxygen in a manner comparable to the human blood system. Like frogs and many other amphibians, tubifex worms are capable of exchanging oxygen and carbon dioxide through their skin. In addition, they can survive food shortages and drought conditions by forming a protective cyst and lowering their metabolism. Tubifex worms are hermaphrodic, but to avoid self fertilization, the male and female organs become mature at different times. Cross fertilization occurs when two mature Tubifex worms join their anterior and ventral surfaces together with their anterior ends pointing in opposite directions. The female reproductive opening of each worm is nearer to the male opening of another worm allowing the penial setae of one worm penetrate into the tissues of other worm and join the two together. When the sperm of one worm is then passed into the spermathecae of the other worm, they separate and begin to produce egg cases called cocoons. After the cocoon is formed the Tubifex worm withdraws its body from the egg case using backward wriggling movements allowing the cocoon to hatch. Although massive balls (colonies) of Tubifex tubifex are occasionally observed in the water columns of lagoons, ponds, streams, marshes, and canals of their range, their natural habitats are usually devoid of the sufficient oxygen needed by their predators to survive, so Tubifex tubifex can “afford” its bright red color without fear of predation. Commercially, tubifex are available alive, frozen, or freeze dried . For most tropical fish keeping enthusiasts, tubifex worms are most often used in their freeze dried form as a high protein aquarium food for almost all freshwater species, however as a live food, they are fed to fish, frogs, salamanders, snails , shrimp , crabs, crayfish , turtles, etc. Live tubifex worms are used by breeders to maintain and condition tropical fish and other aquatic species. Even the pickiest of eaters will break their fast to chow down on tubifex worms. Live Tubifex worms are available throughout Europe and many northern areas of the United States, and cultures can be purchased from a variety of sources online. Tubifex worms are easily cultured by placing them in long, relatively shallow containers, with 2″ to 3″ of thick pond mud at the bottom mixed with bran, bread, and decaying vegetable matter. The rearing container should be set up to have a gentle, continuous flow of water coming in on one side, and a drainage system on the other side. When you receive your culture, rinse them thoroughly to remove the excess mud and any dead worms in chlorine free, chilled water (between 40° to 50°F), until the run off water is clear and free of debris . Place about a .5″ thick layer of Tubifex worms in the uncovered rearing container with about .80″ to 1.5″ of cool fresh water above the worms. After the Tubifex worm culture is introduced into the container, it will take about 15 days for clusters of worms to develop, and a few days more before they can be harvested. As the worms breed and develop into masses, they will come to the surface looking for oxygen and can be removed from the mud mixture in thick masses. Wash the worms under a stream of chilled water to remove the excess mud. Never use room temperature or aquarium water to wash the tubifex. Once harvested and cleaned, Tubifex worms can be kept for several days in the refrigerator at 40° to 50°F if they are washed daily, or kept under cold running water. It is not necessary to feed them if you do not intend to continue breeding the harvested worms. When kept under continuous running chilled water, tubifex worms will remain in perfect condition for several weeks. The occasional collection of wild tubifex worms from sewage contaminated waters that may harbor human pathogens responsible for hepatitis, tetanus, and a few other bacterial diseases has resulted in live tubifex worms being not as common and readily available as they once were to tropical fish keeping enthusiasts. Concerns by tropical fish keeping enthusiasts about the introduction of parasites into their tanks by tubifex worms has resulted in the development of living, bacteria free cultures by several commercial sources. In addition, tubifex that have been enriched with nutrients and pigment precursors biologically incorporated during the rearing of the worms has resulted in the availability of laboratory produced Tubifex guaranteed free of parasites being sold online as de-watered cultures, packaged on a piece of paper to save on shipping costs. Many picky and hard to feed species like elephant nose fish, rope fish, Axolotls, Discus, etc. apparently love the taste of live tubifex worms, however as with any live food, it is highly recommended to feed your fish a varied diet. Although uneaten worms will not foul your aquarium water, do not feed any more than you fish will eat in about 15 minutes.